Los Cabos is a place of many wonders, from spectacular granite monuments like The Arch at Land’s End to towering desert cacti and the confluence of two major bodies of water, the Pacific Ocean and Sea of Cortez. But for sheer magnificence and natural grandeur, nothing captures the imagination quite like the region’s most famous seasonal residents. Think the roar of a lion or a full-throated elephant rumble is impressive? Imagine a creature the size of 6 full-grown African elephants, 110 golden maned lions, or over 400 adult humans, exerting its maximum force in a random display of playfulness and joy. That’s the spectacle of a breaching humpback whale, a 30 to 50-ton leviathan lifting its entire body out of the water and then crashing back down with enough force to displace several Olympic-sized swimming pools worth of water. For some more perspective, the power required to generate this leap is roughly equivalent to the power needed to lift a Boeing 747 aircraft off the runway and into the sky. It’s a breathtaking sight, and amazingly humpbacks aren’t even the biggest whales. That honor belongs to the blue whale, which at 100 to 150 tons is the largest creature ever to exist on Earth. Bigger than any dinosaur, woolly mammoth or other prehistoric beast. 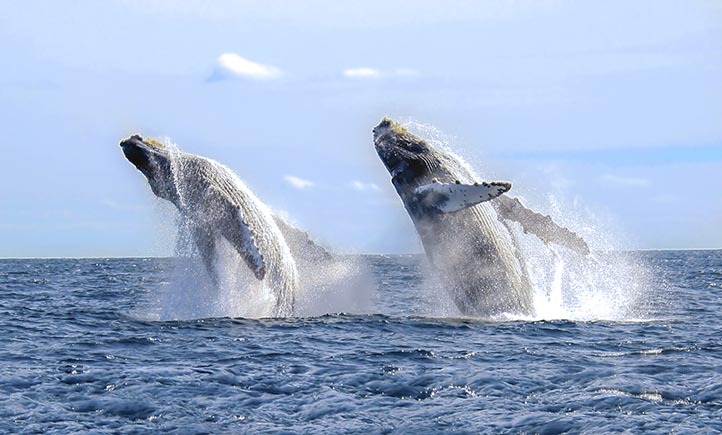 Each year, from mid-December through mid-March, many of these remarkable (and remarkably large) creatures can be seen just offshore from Los Cabos. Estimates vary, but the best guess is that 5,000 to 1o,000 whales journey from their summer arctic feeding grounds to warm water breeding grounds in the coves and lagoons of Baja California Sur each winter. A gray whale named Varvara became famous in 2015 for the longest mammalian migration ever recorded–nearly 14,000 miles round-trip, from Russia to Cabo San Lucas and back–but her journey was only considered special because it was accurately tracked. There are thousands of Varvaras each year, and just like U.S. and Canadian snowbirds, these whales love heading to sunny tropical Los Cabos when the weather gets cold up north. Humpbacks and grays are the most commonly sighted, but sperm whales, orcas and even blues can be spied from touring boats or from coastal homes and beachfront lookouts. Each species has its favored breeding grounds. Big blues like the UNESCO protected Islands of Loreto; grays favor Ojo de Liebre and Magdalena Bay; and humpbacks seek out shallow water Sea of Cortez coves off the southern rim of the Baja California peninsula. 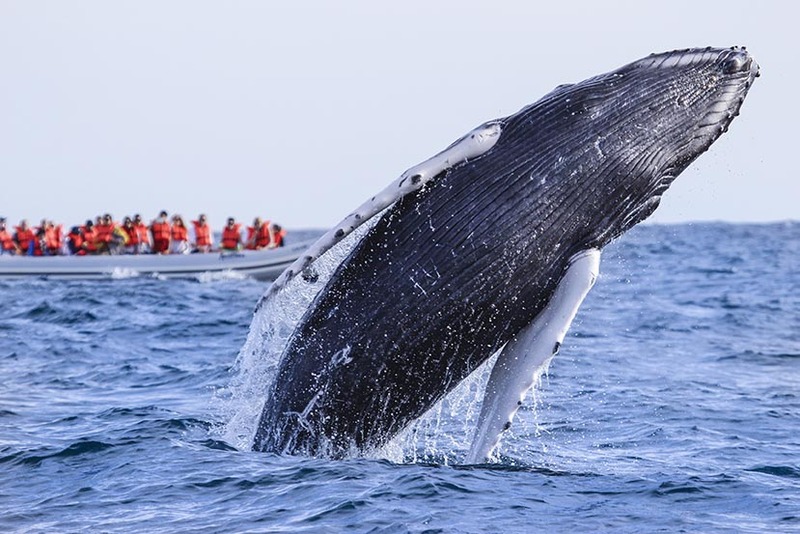 Lucky Los Cabos residents are treated to the biggest show on earth on a regular basis, and statistics or comparisons can’t really do the majesty of these seasonal visitors justice. They are beyond comparison, and enumerating how high water shoots from their blowholes (20 – 25 feet) or how large their lungs are (big as a car) doesn’t really prepare one for the thrill of seeing a live whale up close. It’s almost a kind of magic to share the same space and breathe the same air, and the fact that they are commonly seen for several months each year never lessens the impact. That’s really the wonder of Los Cabos, when you think about it. The common is never commonplace.